Outgoing U.S. Vice Consul Paul Neville introduces his replacement; Marc Miller. The affable and handsome Paul Neville and his lovely wife Tina are headed to Tijuana for Paul’s next posting, bringing Marc Miller from the U.S. Embassy in Beijing to take Paul’s place as Vice Consul at the U.S. Consulate in Chiang Mai. 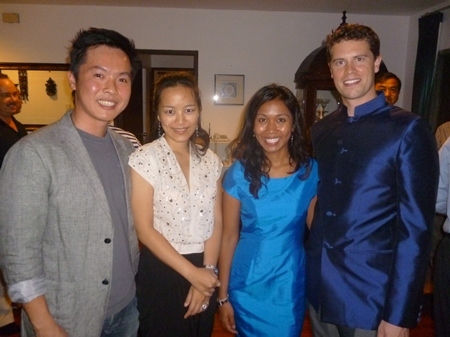 Paul and Tina hosted a party for a small gathering of friends, fellow Americans and Thais to introduce Marc to Chiang Mai and get him ready to start his official duties as Vice Consul in Chiang Mai. Paul introduced Marc to the group with a few comments, nothing that he and Tina would both miss Chiang Mai very much, having enjoyed their stay here very much. Marc, from Oklahoma, said he was looking forward to Chiang Mai’s beautiful weather and culture. 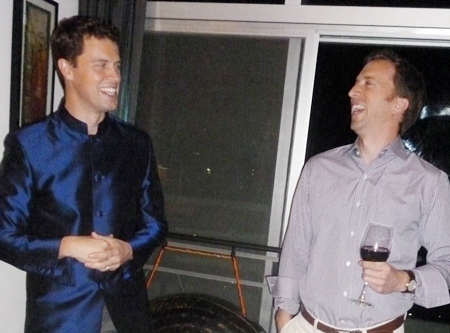 The two men laughed noting that they both attended Georgetown at the same time but didn’t really get to know each other until after they had entered the State Department’s Foreign Service. Marc said he re-introduced himself to Paul recently, telling him, “I am the man who has come to take your job.” He then concluded that if anyone had any questions please feel free to ask, although he is not a consular officer here, he did have act as one in Beijing so is fairly conversant in visa and other issues. Welcome to Chiang Mai Marc, enjoy your tour here, we all know Paul certainly did! 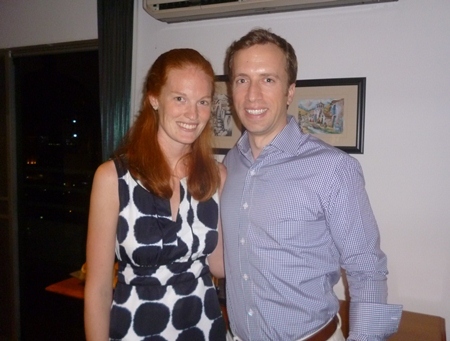 Paul and Tina were gracious and charming hosts for the incoming Vice Consul. Smith Taweelerdniti and his bride Loognum joined the party to bid farewell to friends Paul and Tina. 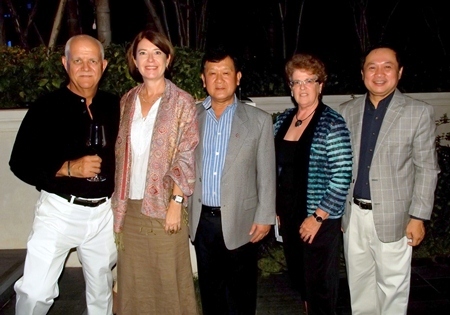 Smith recently travelled to the United States on a fact finding tour for Chiang Mai Creative City. Marc is joined by his girlfriend Mary at the party. Vice Consul Jin-Fong Lam and Nancy Lindley of Lanna Care Net share a brew! Once again the fabulously beautiful venue of 137 Pillars House plays host to a charitable concert, with the famed Jazz duo of Tuck & Patti and Matthew Kelly performed pieces with the beautiful historical building as a backdrop. The lovely garden in front has played host to several charitable events recently and the cool night and charming surroundings were the perfect backdrop for the fabulous music. 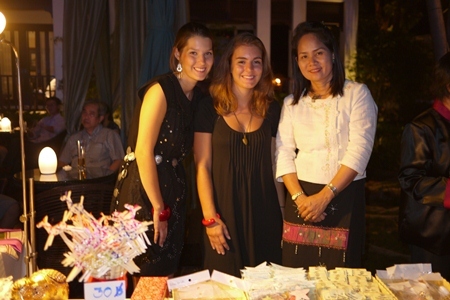 The concert was held on January 5, 2013 to aid the School for Life, an international foundation in Chiang Mai that cares for children in difficult situations. Originally set in place to take in HIV/Aids orphans, the school now takes in needy children, either orphans or those who come from abusive homes. The School for Life was established in 2003 and has provided a new home to over 140 children. The school has a close working relationship with the Ministry of Education and the Provincial government. More information about the School for Life can be found at their website: www.school-for-life.org/en/. 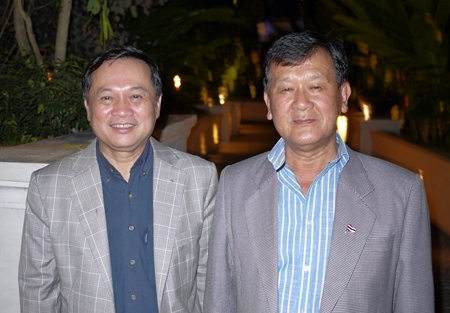 Chamnan Chanruang joins Governor Tanin Subhasaen for the opening of the charity concert on January 5, 2013. 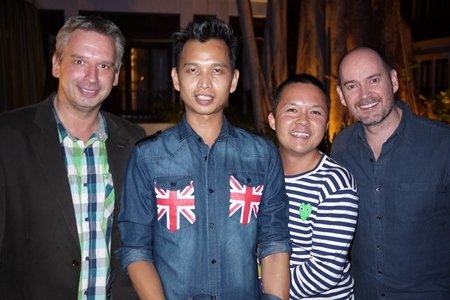 Manfred Ilg, General Manager of 137 Pillars House Resort is joined by Anurak Hutasing, Chris Chun and Matthew Baird. Volunteers from the School for Life man the table, giving out information and selling souvenirs for the event. 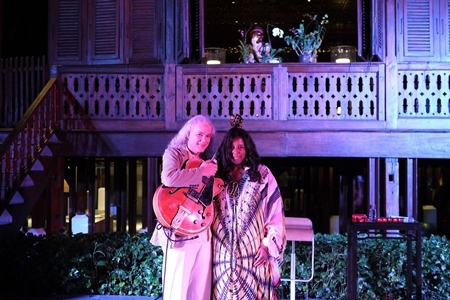 Tuck & Patti, the American jazz duo of jazz guitar and vocals, performed in front of the beautiful backdrop that is 137 Pillars House. 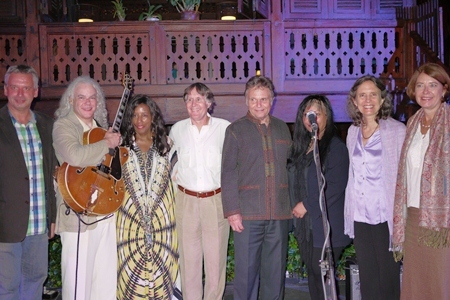 Sponsors, musicians, organizers and hosts joined together for a group photo before the start of the concert. 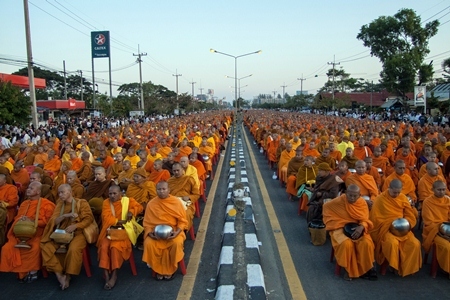 Laypeople thronged the city streets to make merit on December 30, 2012 at the Chiang Mai-Phrao road at 6:09 a.m. where 12,999 monks gathered in an alms giving ceremony to honor the 2600th anniversary of Buddha’s enlightenment. 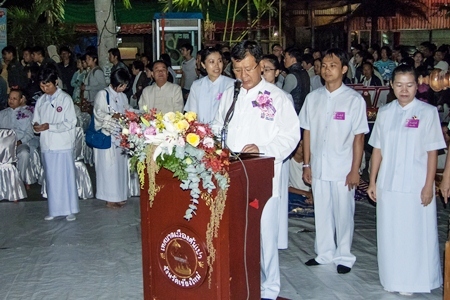 Notable Chiang Mai officials joined in the International Alms Offering ceremony as well as thousands of residents. Monks from around the region traveled to Chiang Mai to take part in this auspicious occasion. Last year a similar ceremony was held with 11,999 monks. This year, in order to mark the auspicious occasion of Buddha’s enlightenment the number 12 was chosen as the concluding number of 2012 and 999 is a lucky number in Thai tradition as the number 9 is significant as the concluding number in every cycle with the new cycle starting at ten. Monks gathered for prayers before the alms giving. The club wear for men show was held at the Ram Bar on December 30, 2012. U.K. 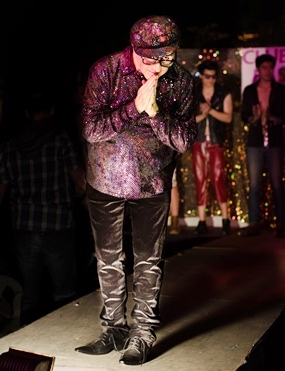 Fashion designer and Chiang Mai resident Lawrence Goldberg held a fashion show on December 30, 2012. He presented 30 different outfits for men in a 45 minute show. 10 models did a quick change between taking to the catwalk. Additionally there was a special performance in between two showings of his collection. Lawrence is a well-known staple on the Chiang Mai social scene, having attended the London School of Fashion, his distinctive club wear designs for men were well received by the many onlookers in the audience. Lawrence Goldberg introduced 30 men’s outfits on the stage. Fashion designer Lawrence Goldberg of London and Chiang Mai presented his latest collection to friends and fans.